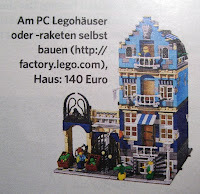 A bigger picture of Market Street found by ApophisV - There's an indepth discussion going on about this set in the Eurobrick forum. I like the boxes of fruit and the balconies. This picture shows the minifigs in more detail. Looks like one of them is wearing the classic overalls but in green. Have to say - bit surprised about the price. Converted into UK sterling that would be 96.00 pounds... That's more than the Cafe Corner... and The Statue of Liberty 3450 when it came out a few years ago. Fingers crossed this is a mistake, unless there are hidden parts inside?? ?